Because the Church commemorates St. Timothy, pastor and confessor, on January 24, we are posting today an excerpt from Preaching is Worship. Preaching is arguably the most important work of the Christian pastor. Multiple contexts surround the sermon and impact the sermon, even when the preacher is unaware of them. Homileticians may identify as many as seven preaching contexts: theological, literary, historical, personal, cultural, pastoral, and liturgical. The last of these is the primary focus of Preaching is Worship. A sermon needs to have peripheral vision; otherwise, it will be myopic. With the text squarely in the center of his visual field, the preacher must be keenly aware of context: the context of his hearers and the context of the surrounding texts and actions of the liturgy. The sermon is never an isolated event. It is a part of a greater whole. In a liturgical context, the sermon is closely tied to the readings that preceded it and the Supper that follows. The hearers, too, are linked to their Baptism on the one hand and the forthcoming meal of the Lord’s Supper on the other. The sermon is the table talk of the baptized, with the pastor serving as the paterfamilias, the head of the family, interpreting the Word of God to the circle of baptized children of God who have come to have table fellowship with Christ. The sermon serves the liturgy by interpreting and applying the Word of God within the greater context of Baptism and the Lord’s Supper. The liturgy serves the sermon by providing a stable context for preaching by which the saving acts of God are remembered by the gathered congregation of the baptized. The liturgy is itself the Word of God. This plain fact is often overlooked by those who are opposed to fixed liturgical forms. The liturgy is not the Word of God in the sense that God gave a particular form or setting for worship in the New Testament. The New Testament has no ritual book corresponding to the Old Testament Book of Leviticus. There is no divinely established form of worship in the New Testament, nor are there divinely mandated texts. There is only the pattern of teaching and table, Word and Sacrament, apostolic doctrine, the fellowship, that is, the breaking of the bread, and the prayer (Acts 2:42), and the various liturgical traditions that have been handed down to us through the ages. The liturgy is the Word of God because it is almost entirely composed of quotations from the Holy Scriptures. The traditional canticles of the Kyrie, the Gloria, Sanctus, and Agnus Dei are all taken directly from the Holy Scriptures. The creeds are nothing less than a summary of scriptural doctrine concerning the tri-unity of God and the person and work of Jesus Christ. The liturgy also interprets the Scriptures by applying the passages to the hearers and bringing these passages into interpretive contexts. Why do we pray “Lord, have mercy” at the beginning of a Divine Service? Why do we sing Jesus’ birthday song, “Glory to God in the highest,” before we hear the Word of God? Why do we chant “Holy, holy, holy” and “Lamb of God” before eating and drinking the Lord’s Supper? What does it mean when the death song of Simeon (Luke 2:29–32) becomes our prayer at the close of the day and after receiving the body and blood of Jesus in Holy Communion? The preacher who is open to such questions will be in a good position to unfold the meaning of the liturgy in the ordinary course of his preaching. . . . Unfolding the liturgy means unfolding what God is doing here and now for us and for our salvation. Liturgy goes on in the present, bringing forward the past and propelling us toward the future in Jesus Christ. God is at work in the liturgy making His creative and redemptive presence manifest to us, intruding into our lives, killing us and making us alive with the Law and the Gospel. Liturgical preaching is always Law and Gospel proclamation and is never simply explanation. We are not actors playing roles in some liturgical divine drama. Worship is real life, genuine dying and rising. We are standing as sinner-saints in the presence of our Creator and Redeemer who is revealing Himself to us as once He did to Moses in the burning bush. We stand on holy ground, not to kick off our shoes and put up our feet, but to bow down in worship of the Father in the Spirit and in the Truth who is Jesus Christ. We gather to hear the forgiveness of our sins, to eat and drink Jesus’ sacrificial body and blood. Like the Israelite paterfamilias of the Old Testament at the Passover table, the preacher unfolds the meaning of the liturgy for the children at the table (Exod. 12:27). The best way for the preacher to do this is to incorporate little bits of the liturgy into the sermon on a regular basis. A steady diet of liturgical preaching stimulates the liturgical appetite. Sometimes a sentence or two in passing will be sufficient. At other times, a liturgical text may be developed more fully, especially in catechetical preaching. The preacher will always be on the alert for opportunities, even when the appointed reading is not explicitly quoted in the liturgy. Concordance studies are extremely helpful for making the connections. For example, several pericopes that deal with the image of Christ as “lamb” (Acts 8:32; 1 Pet. 1:19; Rev. 5:13; 7:10) provide the opportunity to note our acclamation of Jesus as the Lamb of God who takes away the sin of the world. Sometimes the connection may be topical. The narrative of Abraham and Isaac on Moriah (Gen. 22:1–18; Lent 1, Series B) or the Passover (Exod. 12:1–14; Holy Thursday, alternate and one-year) give the Old Testament content for the Agnus Dei. Familiarity with the structure and texts of the liturgy is indispensable for a preaching on the liturgy that is natural, not forced. Unfolding the meaning of the liturgy in the sermon invites the hearer to explore the liturgy more deeply, to discover previously unnoticed connections and meaning, and to teach others in the joy of discovery, particularly those who are unfamiliar with the liturgy. Preaching becomes a kind of liturgical catechesis in which even the experienced worshiper is drawn more deeply into the mysteries of God. Instead of being simply an arbitrary “worship service” printed in a disposable bulletin, the liturgy becomes something living and active, which is what it is, the living and active, double edged word of Law and Gospel at work, killing and making alive, convicting us of our sins and comforting us by our crucified and risen Savior. From Preaching is Worship: The Sermon in Context, pages 129–32 © 2011 Concordia Publishing House. All rights reserved. 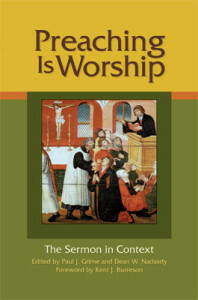 To order Preaching is Worship, please contact CPH at 800-325-3040 or visit www.cph.org.